Over the last decade the convergence of media and technology has turned the marketing world on its head. In order for brands to succeed in today's socially connected world, they must think like publishers and act like media networks. Content to Commerce shows how utilizing publishing- and entertainment-based principles can help brands and marketers use social media effectively—ultimately reaching today's hyper-connected and highly fragmented audiences. From big picture strategy to the tactics and tools require to execute, this book offers a clear approach to social media marketing for both big and small brands alike. 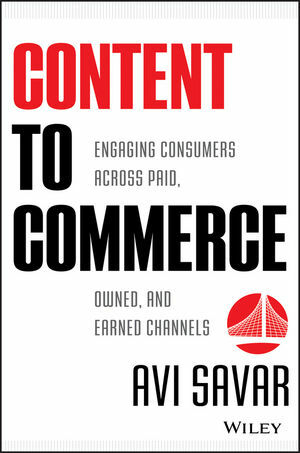 Content to Commerce will show you how to conquer the media world's medium and control your own brand's destiny. AVI SAVAR is the founder and Chief Creative Officer of Big Fuel, a pure-play social media agency designed for the needs of large brands. Since 2004, Big Fuel has helped brands navigate the world of social media and branded content. Today, Big Fuel is one of the largest pure-play social media agencies globallywith over 100 employees and clients that include Burger King, Best Buy, Starwood, T-Mobile, Chase, Microsoft, Gore-Tex, H&M, Samsung, Clorox, and Budweiser. In June 2011, Avi led Big Fuel to a successful acquisition by French media giant Publicis Groupe, giving Big Fuel a global footprint. Prior to founding Big Fuel, Avi was a television producer, creating and developing breakthrough entertainment programming for ABC's Good Morning America and networks including MTV, VH1, Showtime, Fox, and USA. A sought-after industry spokesperson, Avi was recently named President of the inaugural Cannes Lions Branded Content Jury and is a board member of the Social Media Advertising Consortium (SMAC).